In my previous post, I wrote that I was heading to the hospital for a follow up with the doctor and anticipated being admitted. Thankfully, that didn’t happen. Instead, upon inspection she decided the abscess in my neck seemed to be reducing so ordered a double-strength dose of IV antibiotics and another return visit Saturday afternoon. If all goes as planned, I’ll receive one more IV Saturday and then move to tabled antibiotics for another four days. Hopefully, all does go as planned. Thanks for the comments and kind wishes shared on the previous post. I will return to more interesting subjects soon! Thursday afternoon, out of nowhere, I noticed that the left side of my neck was a bit tender and by the evening, it seemed to be swollen a bit. Considering that I’ve never experienced these symptoms before, I decided to go to the doctor’s office Friday morning and have it diagnosed. The diagnosis was that I have a “deep neck abscess” – a bacterial infection inside the tissues of my neck. Dead white blood cells accumulate, forming a mass in the tissue. Normally, this is caused by poor dental health or after an infection of the respiratory system. Neither is the case for me. The doctor wanted to admit me to the hospital right away and get me started on strong antibiotics. A bit hesitant to jump straight to that course of treatment, I negotiated and was instead given IV antibiotics on an outpatient basis with the promise to return this morning. While the swelling and tenderness haven’t become noticeably worse, they haven’t improved, either. I suspect I will have to cave in and be admitted for what will be the second hospital visit in my life. Thankfully, it is happening at the start of a weekend, so the timing is only a minor inconvenience. Will have to cancel a trip to the farmer’s market Saturday and brunch plans for Sunday. What I find interesting is that I never had to be hospitalized until I moved to Thailand. I wonder if it is coincidence, the fact that I am getting into my middle years, or perhaps I am really exposed to more bacteria here in Thailand. 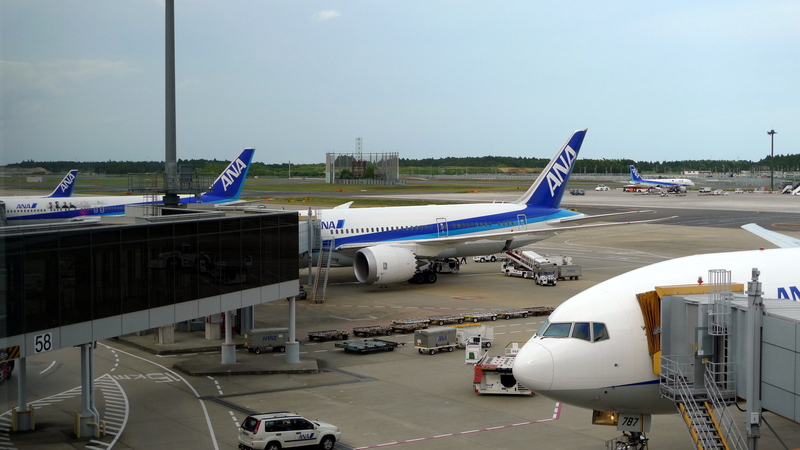 This is the story of my first flight aboard the Boeing 787 Dreamliner, traveling on All-Nippon Airways (ANA) flight 1075 from San Jose, California to Narita airport in Tokyo, Japan. An 11-minute video version of this trip report is embedded here if you would prefer to watch instead of read. 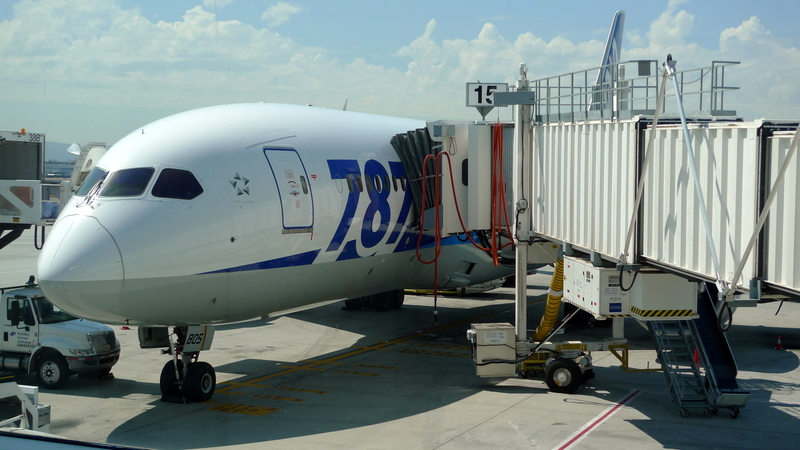 The Dreamliner is a revolutionary wide-body aircraft. Made largely with composite materials, it is about 20% more fuel efficient than the older 767 aircraft it is designed to replace. 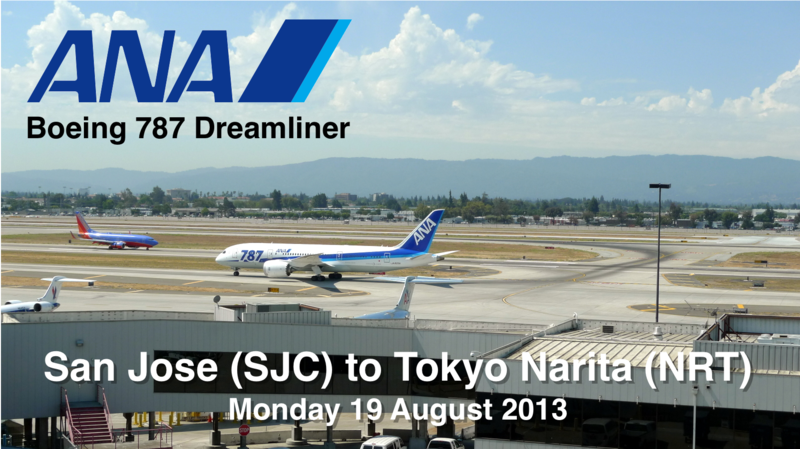 Despite a four-month grounding earlier this year because of electrical problems, the aircraft has performed very well for its initial customers and is opening new “long and thin” routes like San Jose to Tokyo that could not previously have been served profitably. I arrived at the airport plenty early to watch the inbound aircraft land, which arrived about twenty minutes late. Having grown up in the San Jose area and able to remember the days when the airport was a much smaller operation, it is exciting to see this cutting-edge plane regularly scheduled to fly here. 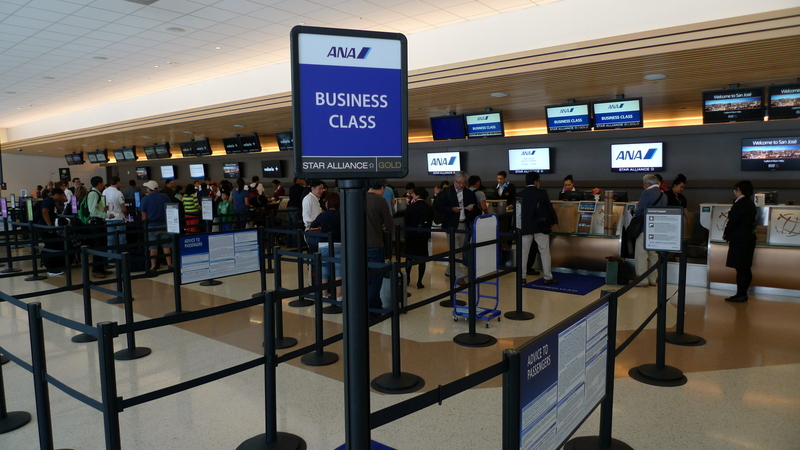 ANA operates from terminal A. Now nearly a quarter-century old, I still recall terminal A as the “new” terminal compared to the 1960s era terminal C that was only recently demolished. As a child, I relished the opportunity to walk across the tarmac and climb a set of stairs to board the airplane. 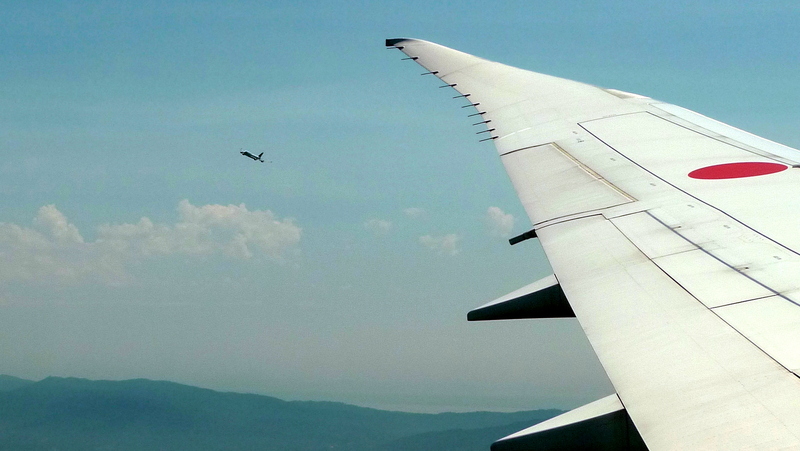 To me, that made air travel much more exciting. These days, the two terminals at San Jose are modern and entirely enclosed. Certainly the facilities are nicer but the travel experience is also more sterile. ANA has a small counter space but lots of employees working check-in. As a Star Alliance gold level member, there was no wait and I was efficiently checked in by a friendly agent. While the agent did not appear to be of Japanese heritage – several of the staff members were – she displayed all the appropriate cultural training such as receiving and handing documents with both hands. This was a nice touch and leads me to believe that instead of relying on contract employees, ANA is using its own staff. 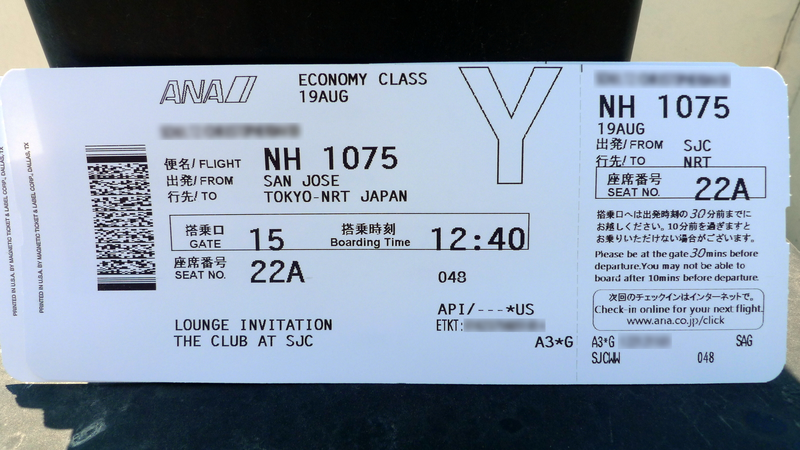 Boarding pass in hand – a window seat in the second row of economy class – I headed up the escalator to the security screening area. The terminal has a single consolidated screening point and while there weren’t that many people in line, the process took a bit of time. In particular, the crew of Mexican budget airline Volaris seemed to be holding up the line, unfamiliar with the TSA’s screening procedures. It took several of the flight attendants multiple trips through the metal detector before they finally removed all of their metal items. 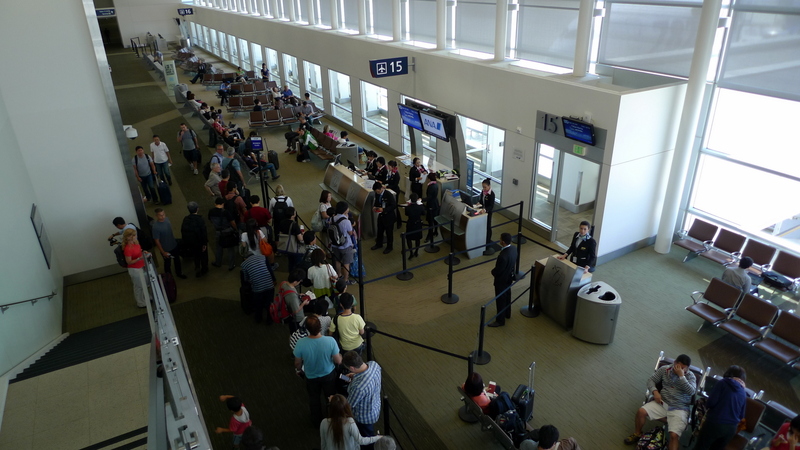 Today’s flight operated from gate 15, one of two gates connected to the International Arrivals Area. This section of the terminal is essentially the connector between terminals A and B. There are few amenities but the windows offer a good view of the tarmac. Unfortunately, the sterile corridor leading to the customs and immigration area means you look out through two sets of windows. I spent plenty of time taking pictures of the Dreamliner. It is a unique-looking airplane, with an asymmetrical nose. The plane’s proportions make it looks smaller than it actually is, perhaps because it looks unusually low to the ground for so large an aircraft. 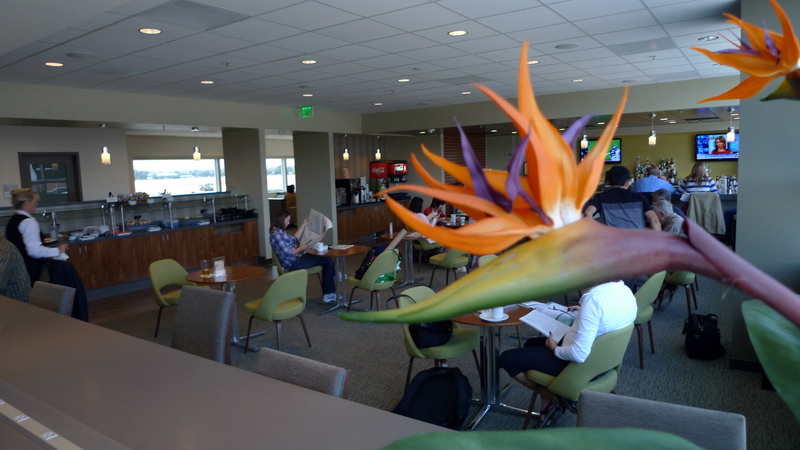 After taking plenty of pictures – something lots of other waiting passengers were also doing – I headed to The Club at SJC, a private lounge that ANA uses for its premium customers. The Club is the only lounge at SJC, where the only dominant airline is Southwest. Located upstairs from the departure gate, the lounge offers limited views of the tarmac but has two large seating areas, workspaces, and a decent selection of food and beverage. They also have a single shower room, so I freshened up before the flight. It was nearing time to board. ANA operates the San Jose service with a 787 in a very low density configuration, only 158 passengers in a plane that can easily seat more than 220. Because of this, the gate area was not crowded. 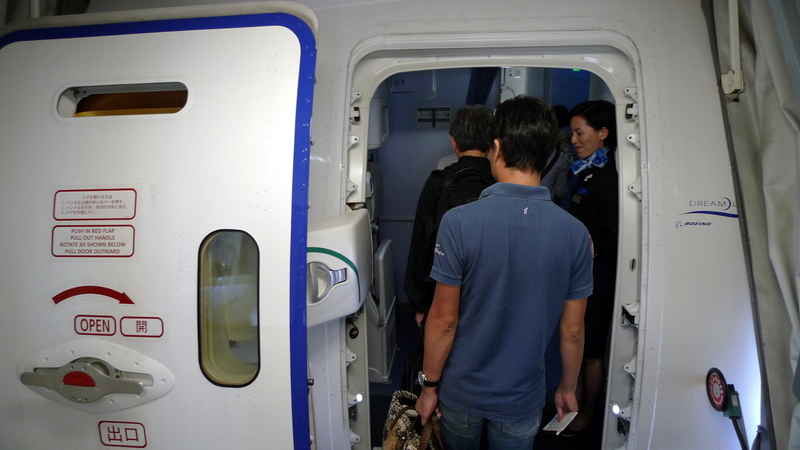 After the highest level members of ANA’s frequent flyer program were boarded, Star Alliance Gold members were invited. A single jetway is used at this gate but with so few passengers boarding, it isn’t a problem. I was welcomed aboard warmly and directed towards my seat. 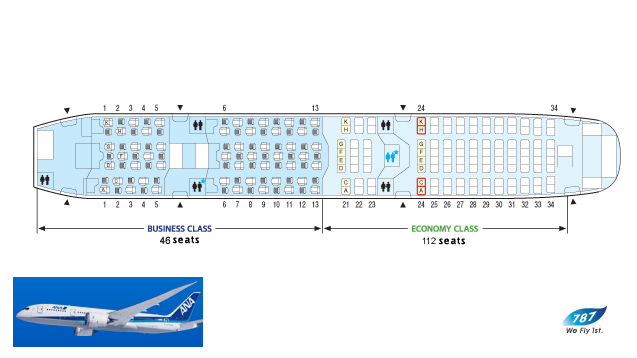 Business class, divided into two cabins, seats 46 people in alternating rows of 1-1-1 and 1-2-1 seating. All seats have direct aisle access and a lot of privacy. The problem with this arrangement is that it isn’t very friendly for couples traveling together. I know that privacy is something that a lot of premium customers value highly, but I prefer arrangements that are a little less cubicle-like. 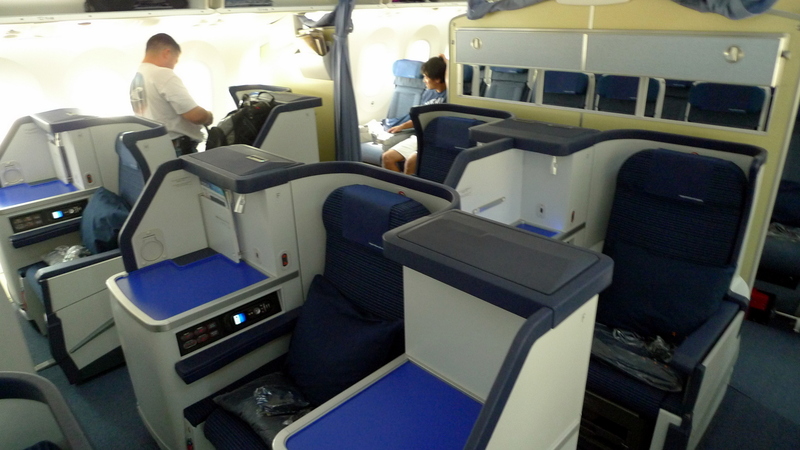 A small economy class cabin of just three rows sits behind business class and the mid-cabin lavatories. In another configuration, this area has premium economy seating with 38” legroom and only seven seats across. I can understand why they made that choice: there is nearly a foot of empty floor behind the last row in this cabin. Even without installing premium economy, they could have added a few more inches to each of these three rows. The design of the overhead bins offers plenty of room to store roll-aboard bags placed on their side. The bins also pivot into the ceiling, making for a very open cabin when they are closed. 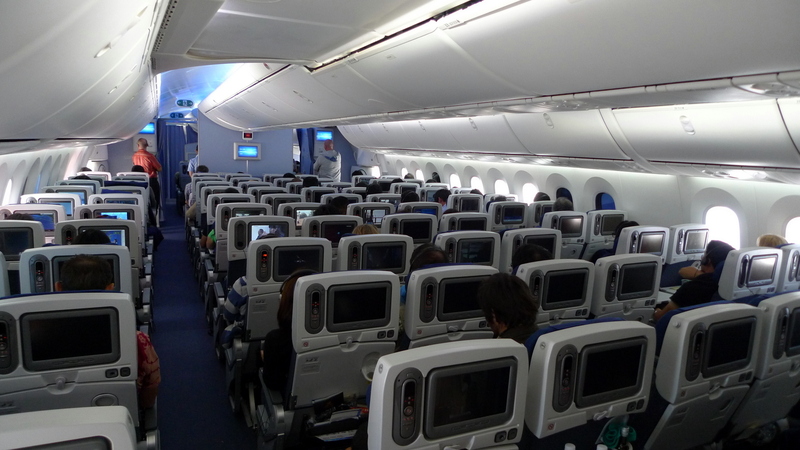 This being a low-density seating configuration, lots of storage space remained even after everyone had boarded. 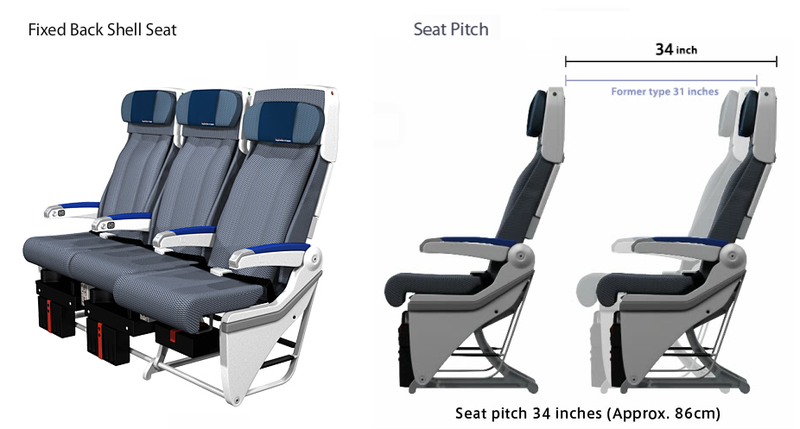 ANA uses fixed-shell seats in economy, where instead of reclining back into the row behind you, your seat slides forward. I like this arrangement because my personal space remains fixed. With 33 to 34 inches of seat pitch, ANA’s Dreamliner offers several more inches of legroom than most competitors including joint-venture partner United Airlines. My one complaint with these seats is that the headrest doesn’t move up and down and, perhaps because it is designed for Japanese customers, it manages to fall at my neck rather than the back of my head. 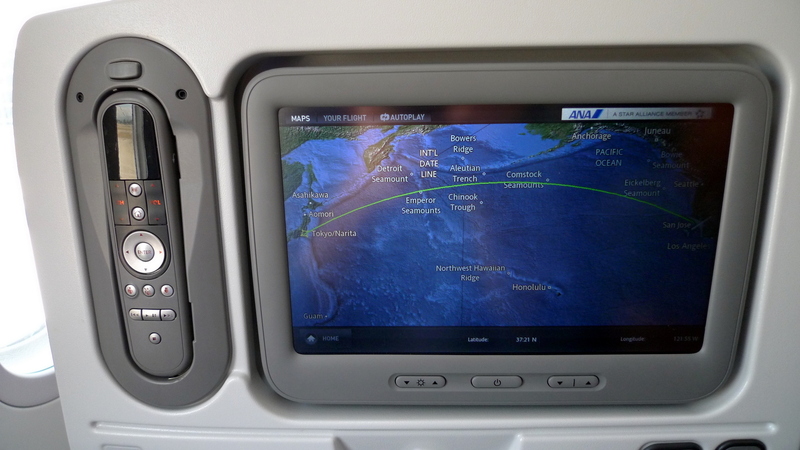 The inflight entertainment system is an “on-demand” system with touch screen controls. The selection of movies, TV shows, games, and music is extensive – plenty to keep you occupied on your flight. The system was also one of the more responsive that I have used. When you touch the screen, it reacts promptly. 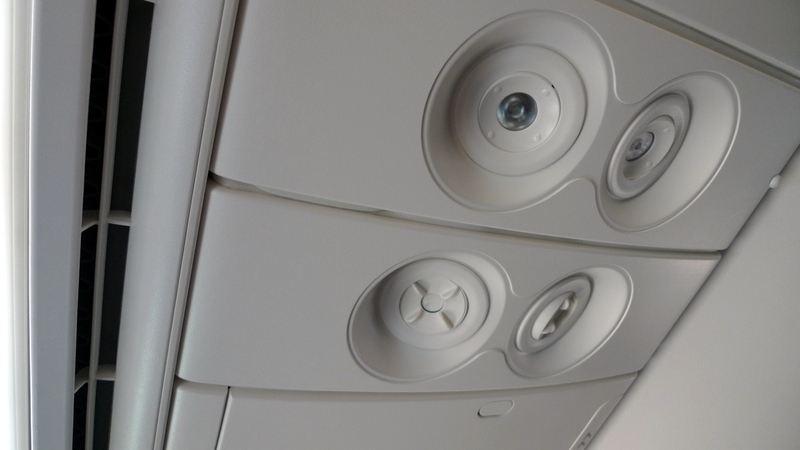 The overhead passenger service unit features a new design and it was nice to be on a wide-body airplane with personal air vents. Boarding was complete in about fifteen minutes and soon enough we had pushed back and the safety demo was finished. 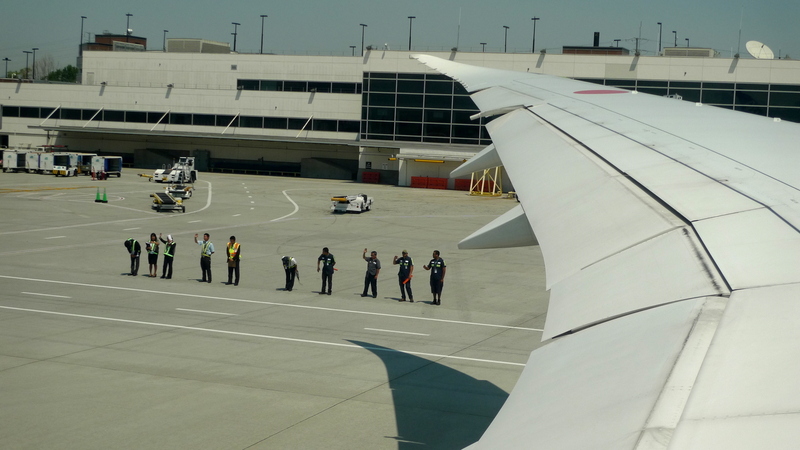 As the engines spooled up – a higher pitch whine than I’ve heard before – the ANA ground staff lined up to send us off with a wave. Being a small airport, we reached the departure end of runway 30 R in just a few minutes. Number one for takeoff, we pulled onto the runway and launched into our roll without a stop. Our departure followed an interesting path, indicated in green on the map. We leveled off at 5,000 feet and maintained that altitude across the south end of the bay, towards Woodside. 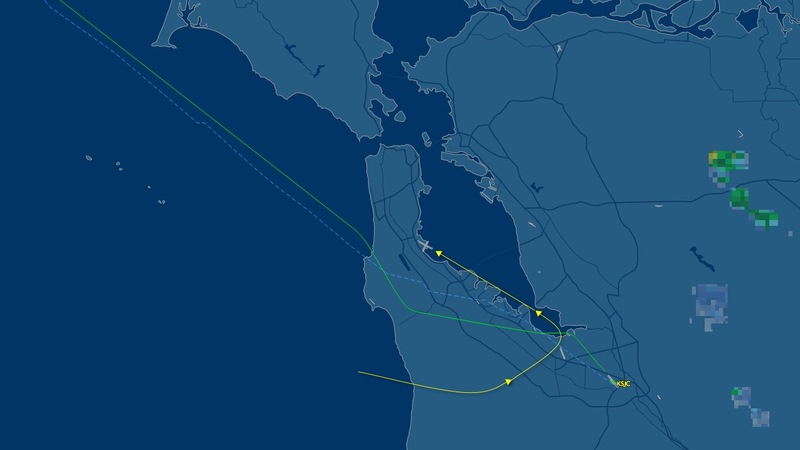 Meanwhile, aircraft were circling wide on our left (yellow on the map), cutting behind us to line up for arrival on runways 28 L and R at San Francisco. While I am confident the air traffic controllers were keeping a close watch on us, the other aircraft came a lot closer than you usually see from your window. It was nice to have such a good view! As we approached Half Moon Bay, we resumed our climb, joining the westbound route across the Pacific. About forty minutes after departure, inflight service began with hot towels – real cloth towels – followed by a beverage service with snacks. 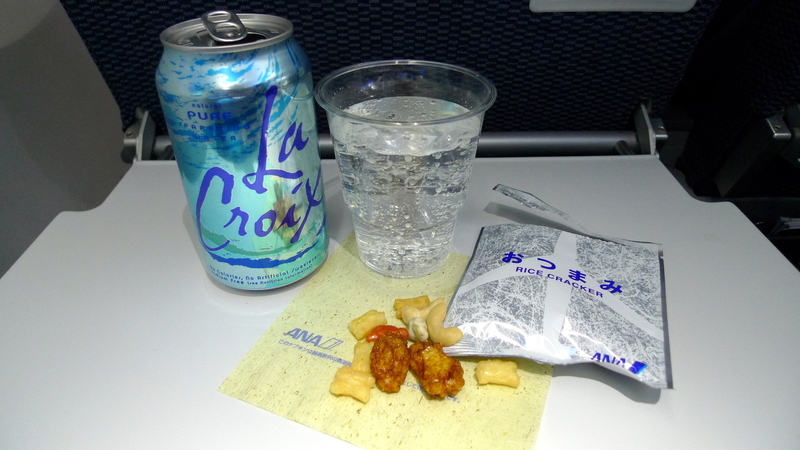 The snacks were simple – rice crackers – and the selection of beverages included complimentary wine, beer, and spirits. The crew was friendly and helpful and there were no difficulties in communicating with them in English. 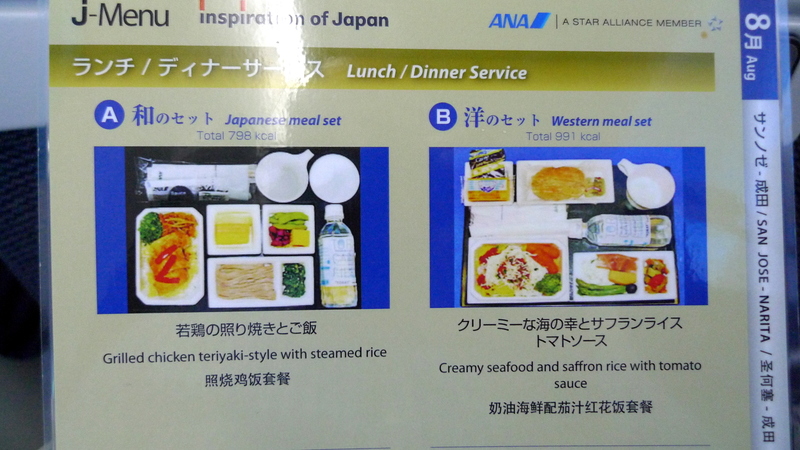 An in-seat menu card described the general service while the specific meal choices for today’s flight could be read on the inflight entertainment system and also on laminated cards the flight attendants had on their carts. 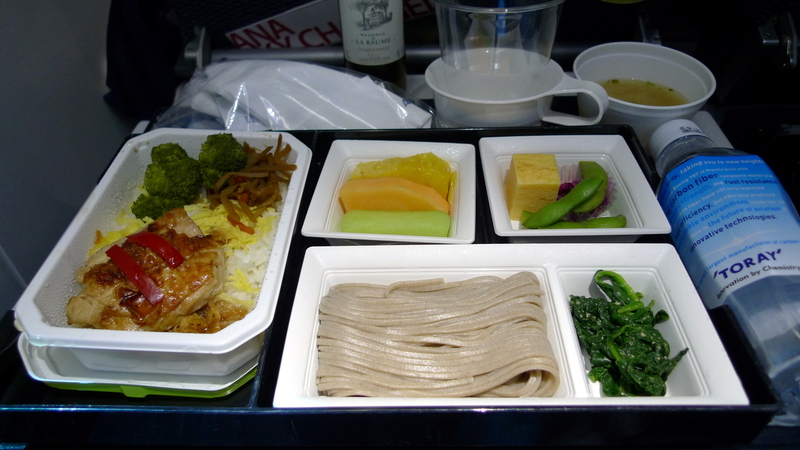 For dinner, I chose the Japanese option – a chicken teriyaki dish served with cold soba – buckwheat noodles. The portion was generous and the food was tasty. The dinner also included miso soup served from a pitcher. 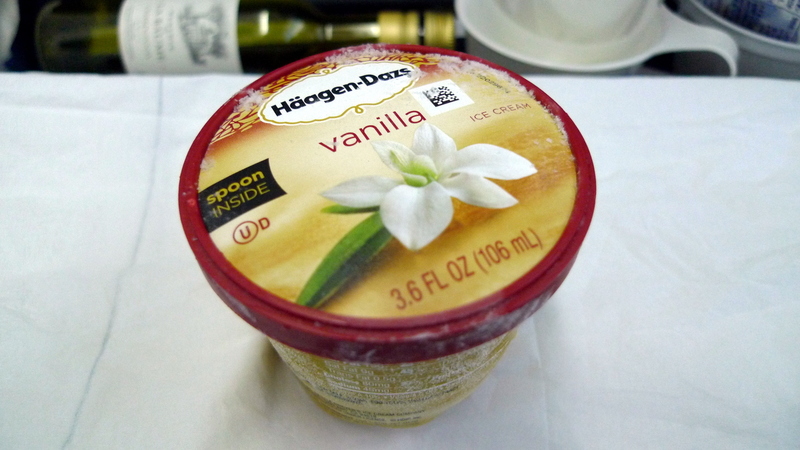 Afterwards, flight attendants distributed Häagen-Dazs ice cream – a simple and satisfying dessert. Since the meal was served with metal cutlery, I could use an actual spoon to scoop the rock-hard ice cream instead of the flimsy plastic one contained inside the ice cream container’s lid. After lunch, I walked around the mostly-full cabin. You can see the windows, which are about thirty percent larger than conventional airplane windows. Truthfully, this didn’t make as big an impression on me as I thought they would. 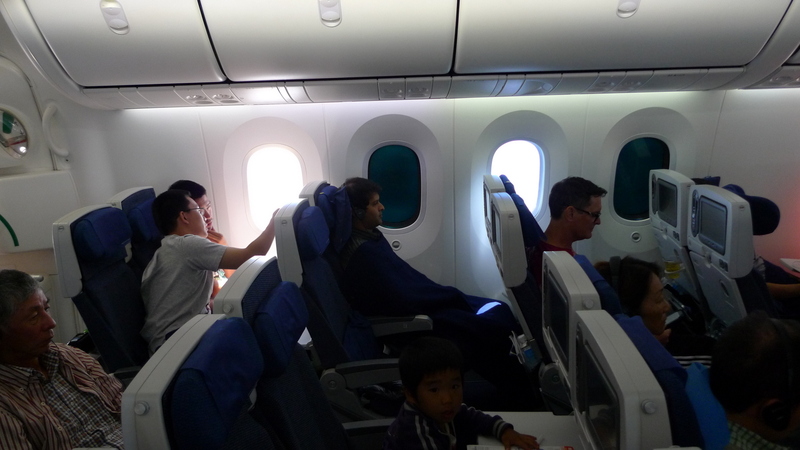 Sure, the windows were large, but the biggest effect was that it made the cabin look narrower. I’m not sure if that makes sense, but because I am used to a standard-size window, as I looked across the width of the cabin and mentally estimated the width, the wall looked closer to me than it really was. Instead of shades, the windows use LCD controls for different levels of shading. Above, you can see two of the windows at the maximum-dark setting. 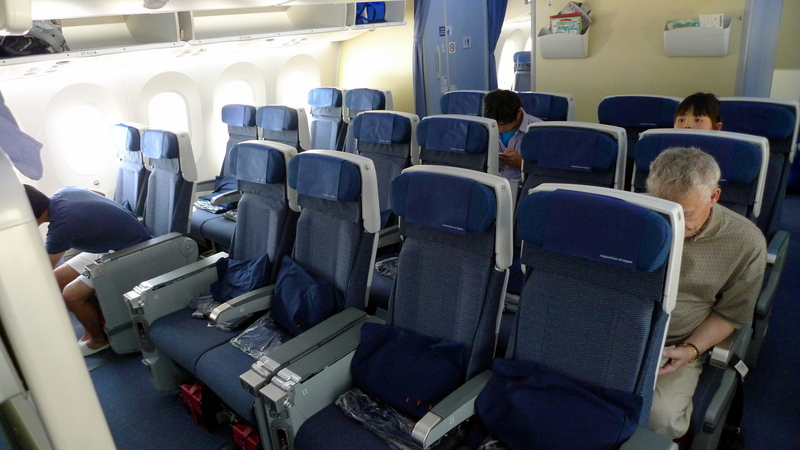 The rear cabin has eleven additional rows of economy class seats. As you can see, the cabin has a spacious feel and the 2-4-2 arrangement is quite pleasant. Unfortunately, ANA is moving towards a 3-3-3 arrangement like most operators so the comfortably wide seats will be a thing of the past. I can understand the economics but will say that as a customer, I will go out of my way to fly an 8-abreast 787 instead of a 9-abreast configuration. The other thing I noticed is that the screens on the entertainment system are coated in such a way that they are not visible unless viewed almost straight-on. For example, I couldn’t tell if the person seated next to me had his screen on until I leaned over to look. This would seem to be a good thing, minimizing extraneous light and also giving greater (although not complete) privacy in what you are viewing. The galley and entrance to the crew rest area are at the rear of the cabin. This arrangement is nice because it gives the crew plenty of space to work and minimizes the number of passengers congregating in this area. Instead, the congregate mid-cabin by the lavatories. 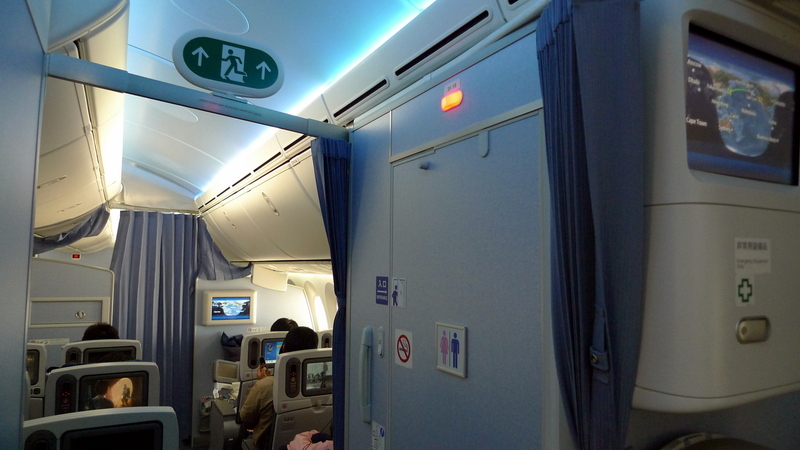 Three lavatories are in the middle of the economy class cabin, located by doors 3 left and 3 right. I didn’t get a picture or video of them, but the doors are hinged in an interesting way. Instead of pivoting on a hinge at one side of the door or folding in half, the door slides and pivots into the toilet, lying flat against the side wall. This improves the accessibility of the lavatory although isn’t intuitive. I noticed several people pushing and pulling the door before they figured out how it moved. 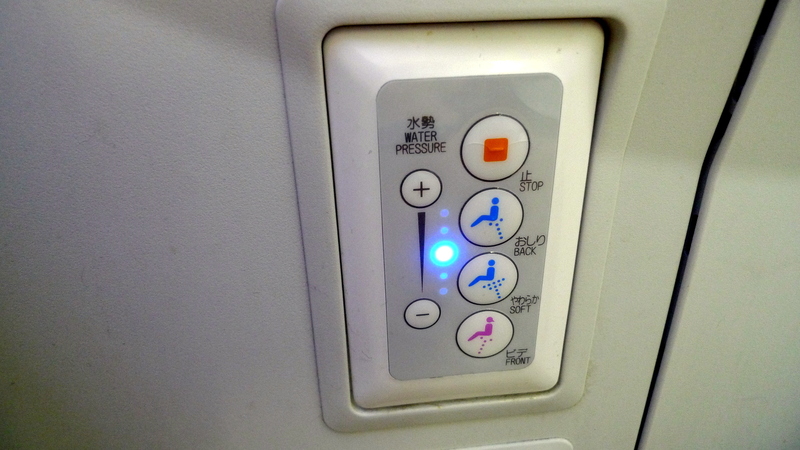 The lavatories are high-tech on ANA featuring lots of buttons, including for the automated bidet, in case you need to wash your bum afterwards. 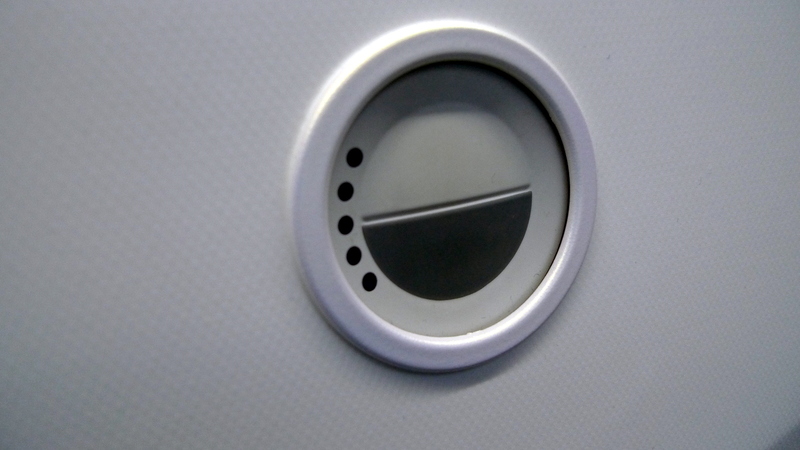 When you press the flush button, the toilet seat cover is automatically lowered. Oddly, though, the flush happens while the cover is still lowering. 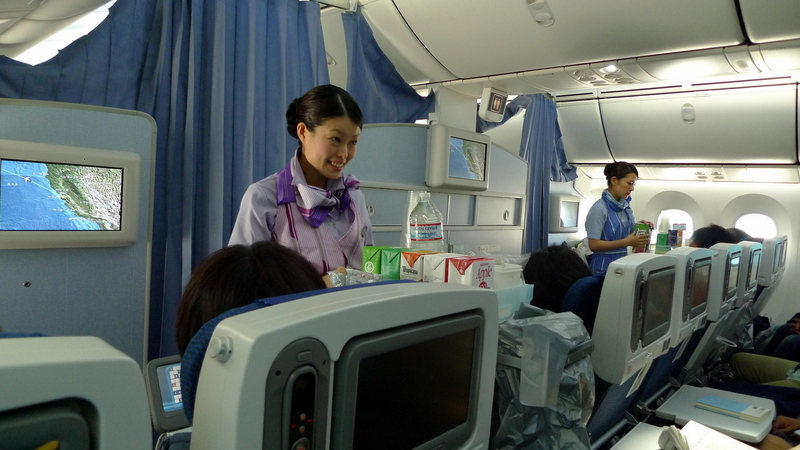 Lavatories were kept clean with flight attendants tidying them throughout the flight. The LCD shading for the windows is interesting. Instead of having physical shades that you pull shut, there are two buttons that allow you to increase the tinting along five settings from nearly transparent to nearly opaque. It seems that the most transparent setting still seems to have a light tint to it, or at least that was my impression. At its darkest, you can still see through the window although little light passes through. That may not make sense when I write it, but when you look at the windows from the side, they appear to be completely opaque. When you look at the windows straight-on, you can see through them as if they were very dark sunglasses. Mid-flight, which was still full daylight outside, the cabin was dark although not as dark as with physical window shades. 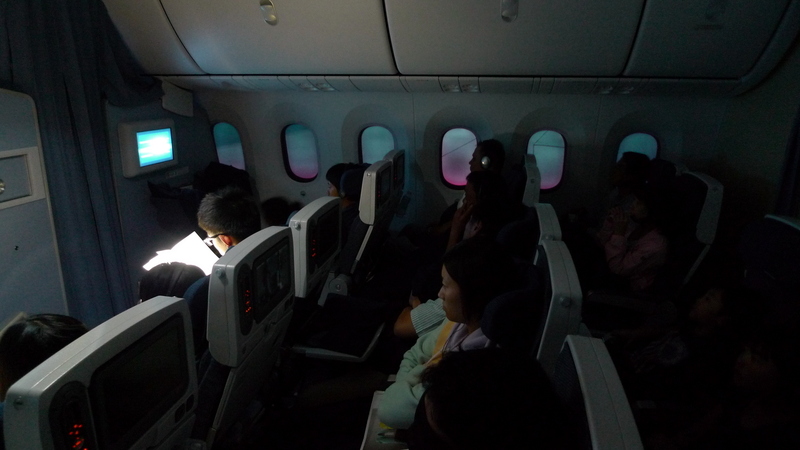 If I’m not mistaken, I think the flight attendants were able to master set the windows to the darkest setting although individual passengers could modify the settings for their own windows, making them more transparent as they wished. 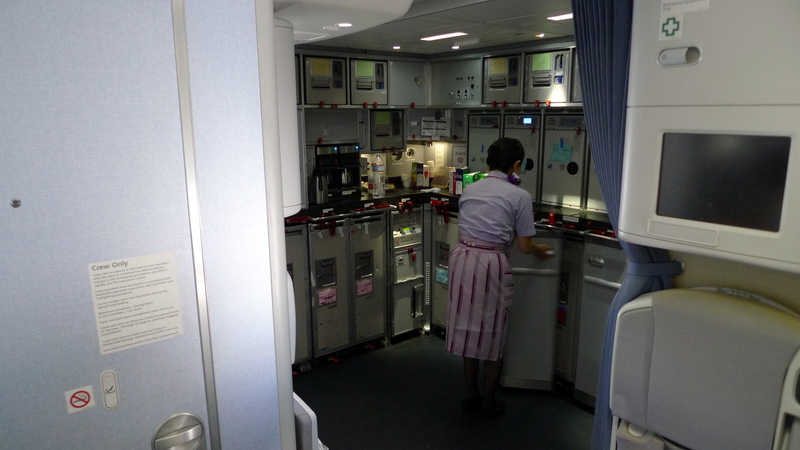 Snacks and beverages were available in the galley throughout the flight. 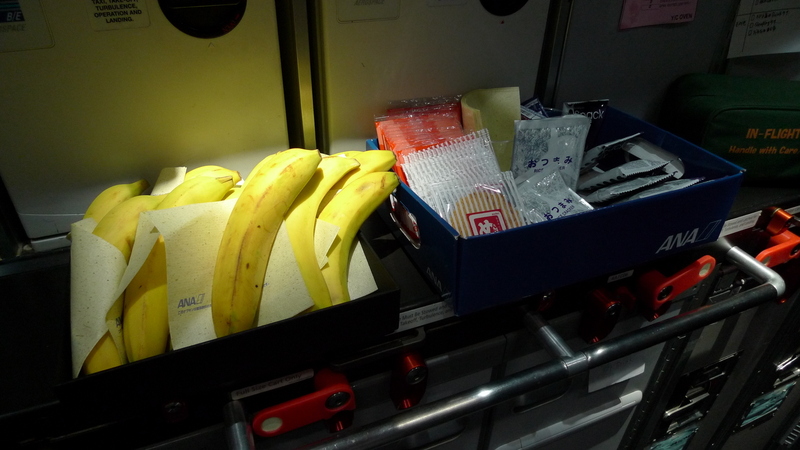 The selection was basic – some crisps and crackers along with bananas. 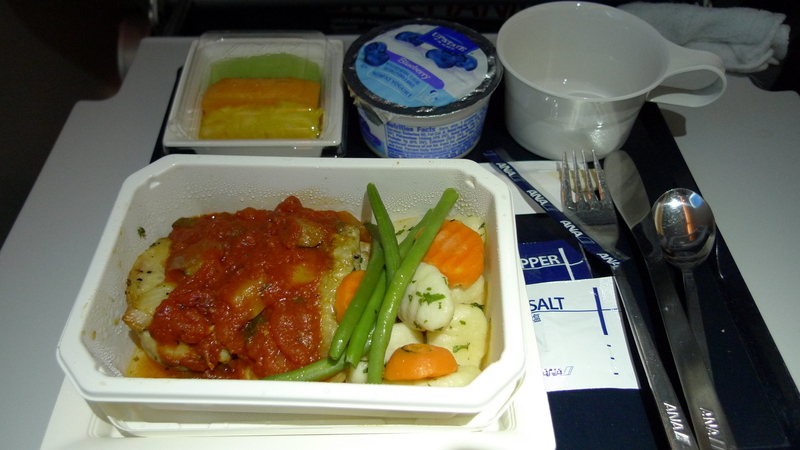 About two and a half hours before landing – just a little early, in my estimation – a second meal service was offered. 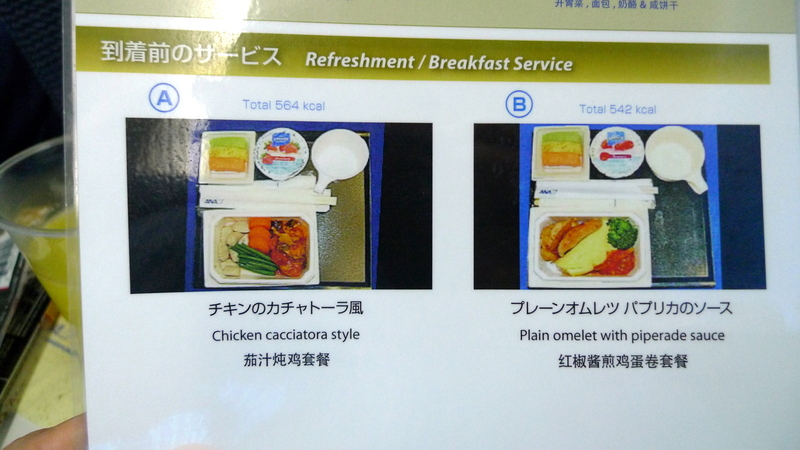 Unlike lunch/dinner, which had clear “Japanese” and “Western” options, the choices for the breakfast were less distinct. I had the chicken cacciatore, which was pretty tasty. The portion size was smaller than the previous meal, but considering that we had eaten just five hours ago, that was okay. One feature of the Dreamliner is that its cabin is pressurized to the equivalent of a 6000 foot elevation instead of at 8000 feet, as found in most airliners. Also, humidity levels are slightly higher, about 15% versus less than 5% normally. My impression was that the cabin was a bit more comfortable than normal. I travel frequently across the Pacific and find I get very dried out. The effect could just be psychological but on this flight, I felt less dehydrated. 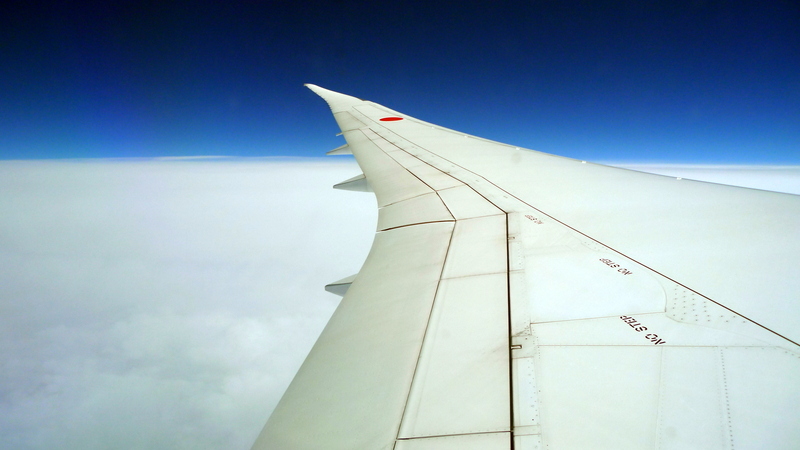 The rest of the flight was smooth as we descended into an overcast northern Japan and landed on-time in Narita. As we approached the airport, there was a lot of other traffic and on our turns there was always a good view of other planes. The rice paddies were also vibrant green and just starting to turn golden yellow. Again, thanks to the low-density configuration, it took just a few minutes to deplane. 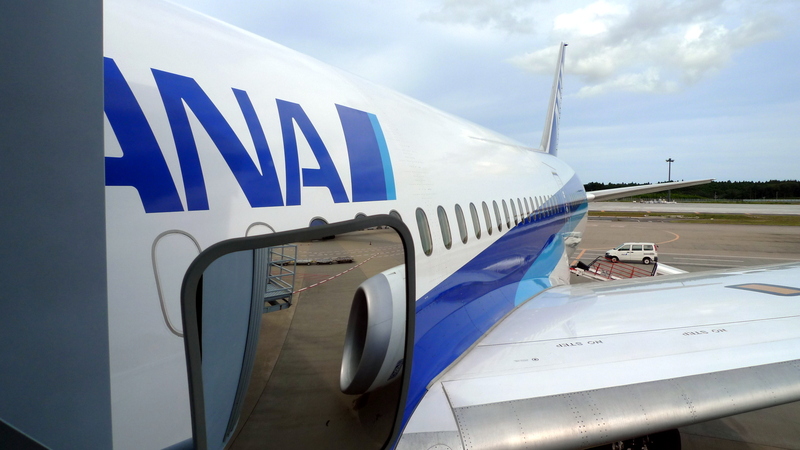 My nine hour, forty-five minute flight aboard the ANA Dreamliner left me with a positive impression of both the airplane and the airline. 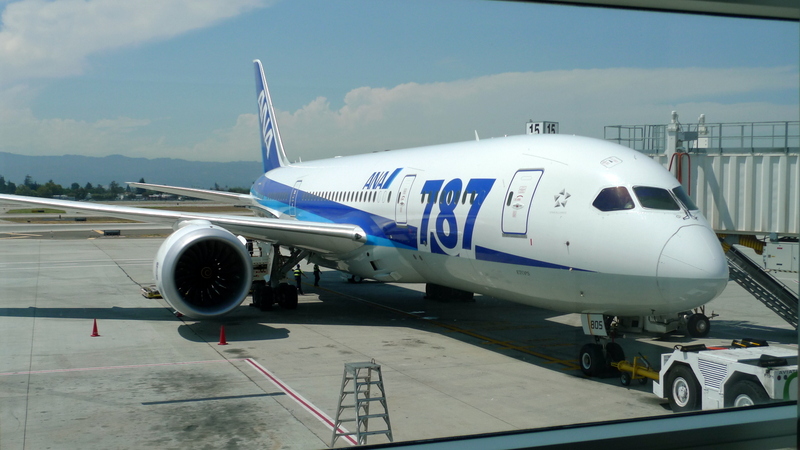 All things considered, I would go out of my way to fly ANA in general and the Dreamliner in particular on future trips. Additionally, flying out of San Jose was a very convenient option so I will keep that in mind for future trips to and from the Bay Area. Tuesday evening, I returned to Bangkok after a twelve-day trip to the United States to renew my Thai visa. This trip, like ever other trip I make by myself, always finds me a bit awash in melancholy. 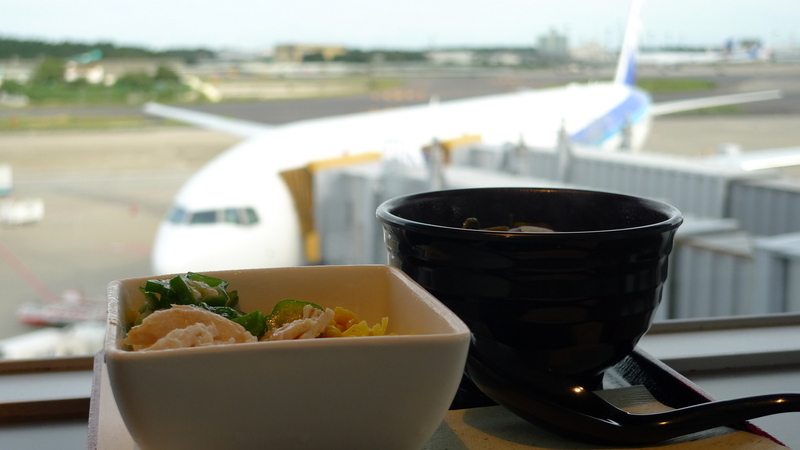 This time, the waves came while eating noodles in the lounge at Narita Airport in Tokyo. I have been traveling by air since I was a month old. Over the years, I have come to associate air travel with so many things: adventure, family, friends, romance, and escape. On each trip, the moment comes when I feel like I am in transit, literally suspended between points in my life. The idea that I am part of a larger network, knowing friends and family around the globe, excites me. At the same time, I feel disconnected and not at home anywhere in particular. It is an interesting sensation and one that, the more I experience it, the more inviting it becomes. Maybe there is a point where I cease to be grounded at all and am forever flitting about the globe. 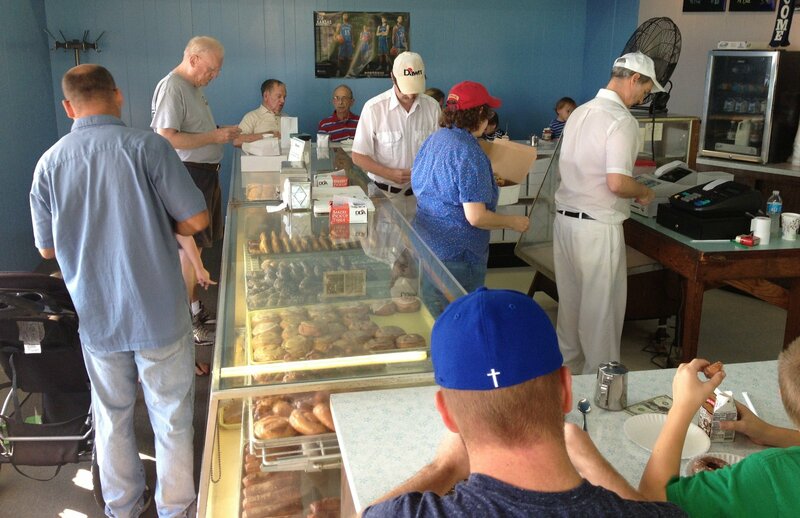 While visiting family in suburban Johnson County, Kansas, I decided to put my jet lag caused early awakening to good use and go buy some donuts. A few minutes of internet research later, I settled on John’s Space Age Donuts. Located in downtown Overland Park, John’s looks exactly as you would expect for a shop that’s been in business since 1967. The dining room has a U-shaped counter with seating on the two legs and display cases across the front. With a large door between the kitchen and dining areas, the place reeks (in a good way) of oil and deep-fried dough. Service is brisk but friendly and the selection is broad, although they didn’t have the blueberry donuts that niece number two requested, so we settled for raspberry. The donuts were still a warm and very surprisingly tasty. They are dense donuts, but neither soggy with oil nor undercooked and doughy. 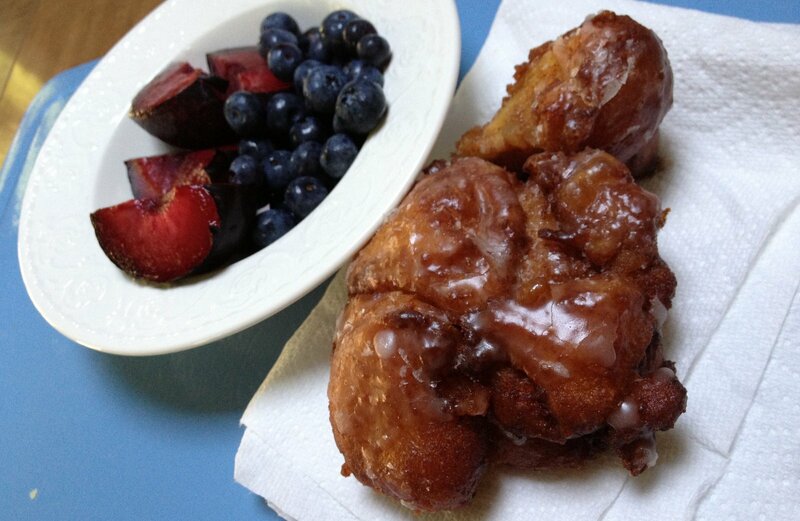 The apple fritter, pictured above, is a masterpiece with a crispy exterior, moist interior, and plenty of apples. 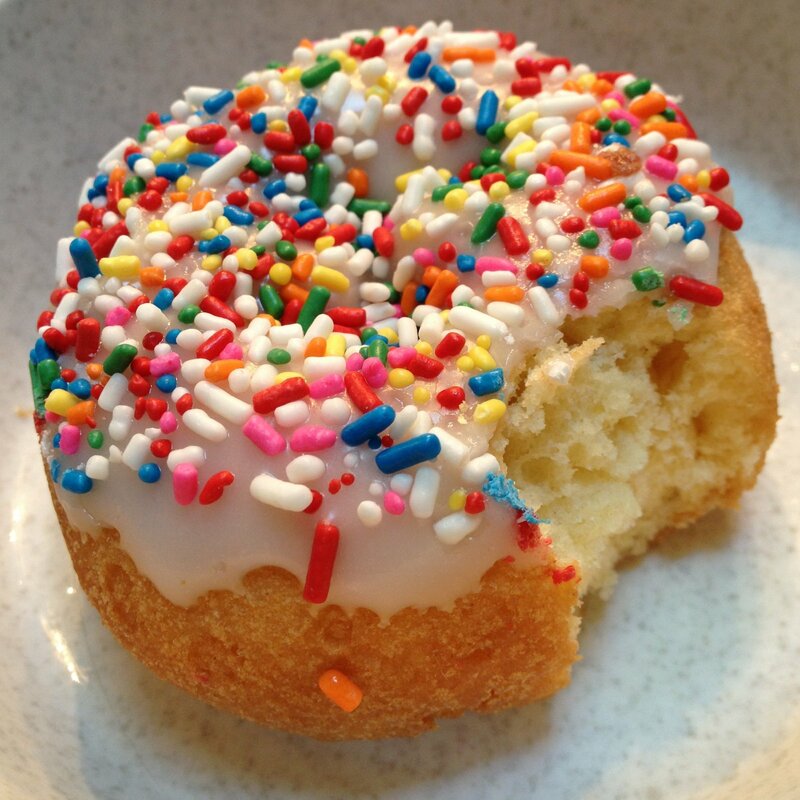 The cake donuts are nice, too, and the dough itself was flavorful. Even unglazed, these donuts would be a pleasure to eat. Unlike some donuts (think Krispy Kreme) that seem to expire within a few hours of baking, these were still fresh when we finished the remaining ones the next day. Must be some of that space age technology! 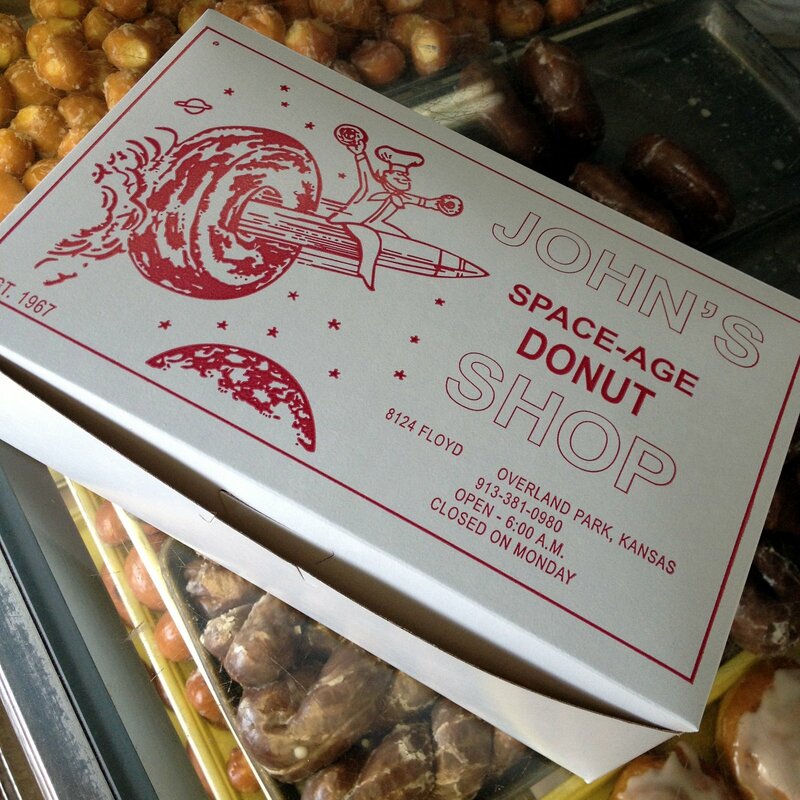 While I am not the biggest donut fan in the world, it is a sure bet that I will be back to John’s Space Age Donuts next time I am in Kansas City. 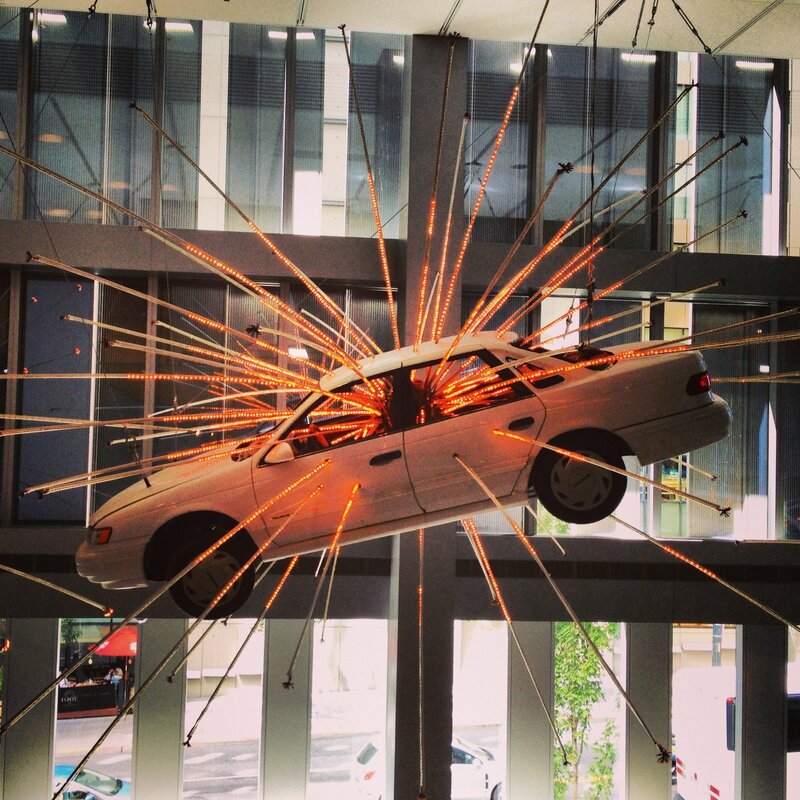 A fourteen hour layover in Seattle was my first stop in the United States. Arriving about 9:30 in the morning, I took the convenient light rail into downtown and conducted my most important business: drawing a money order and then mailing it, and my inch-thick Thailand visa application, to the Thai consulate. After a long wait, a surprisingly helpful postal employee walked me through the steps of buying the money order, properly addressing the express mail envelopes, and then packing everything correctly. After a browse around the Pike Place Public Market and lunch at a cute French restaurant nearby, I visited the Seattle Art Museum to see “Future Beauty: 30 Years of Japanese Fashion“. This exhibit, which runs through Labor Day weekend, has more than 100 dresses from Japanese designers such as Issey Miyake, Kenzo Takada, and Rei Kawakubo. These designers revolutionized the way we think of fashion. I only wish Tawn could have attended the exhibit, which he would have found fascinating. In the afternoon, I went to my aunt and uncle’s house and spent time with them and my cousins. 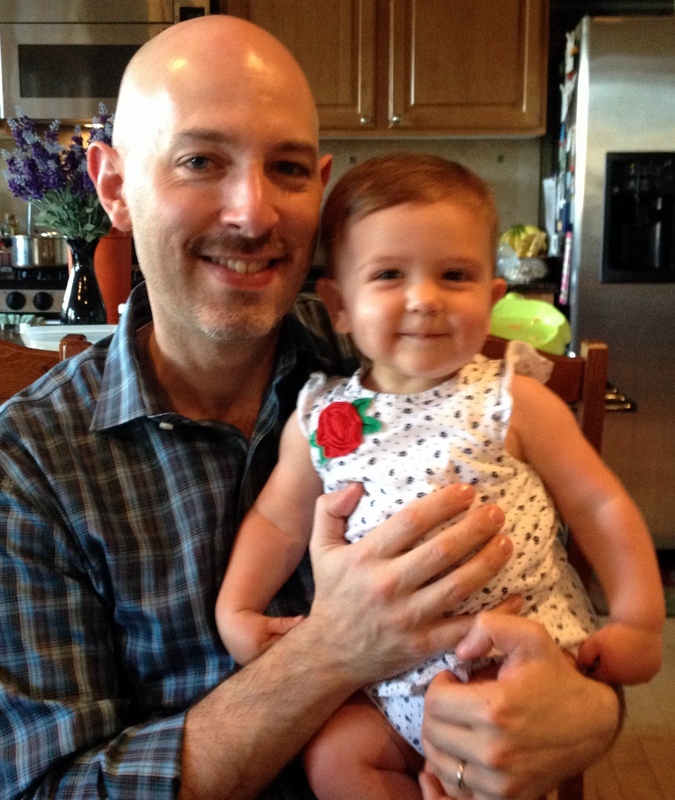 Their daughter is about a year old and I last saw her in March at my grandparents’ 75th wedding anniversary, so it was nice to see how much she has grown since then. My uncle prepared some excellent wild salmon on the grill, so I was well-fed. 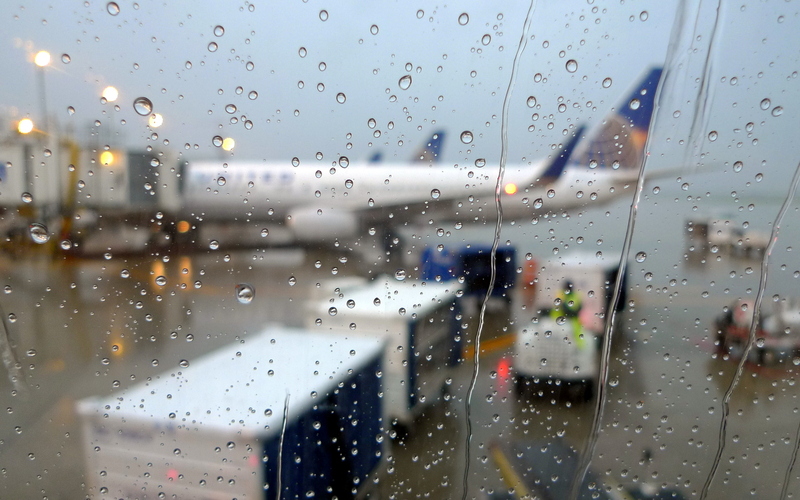 My red eye flight departed Seattle about midnight, heading east to a rainy Cleveland. A two-hour connection allowed me time for breakfast and a shoe shine before I caught my flight into Kansas City. 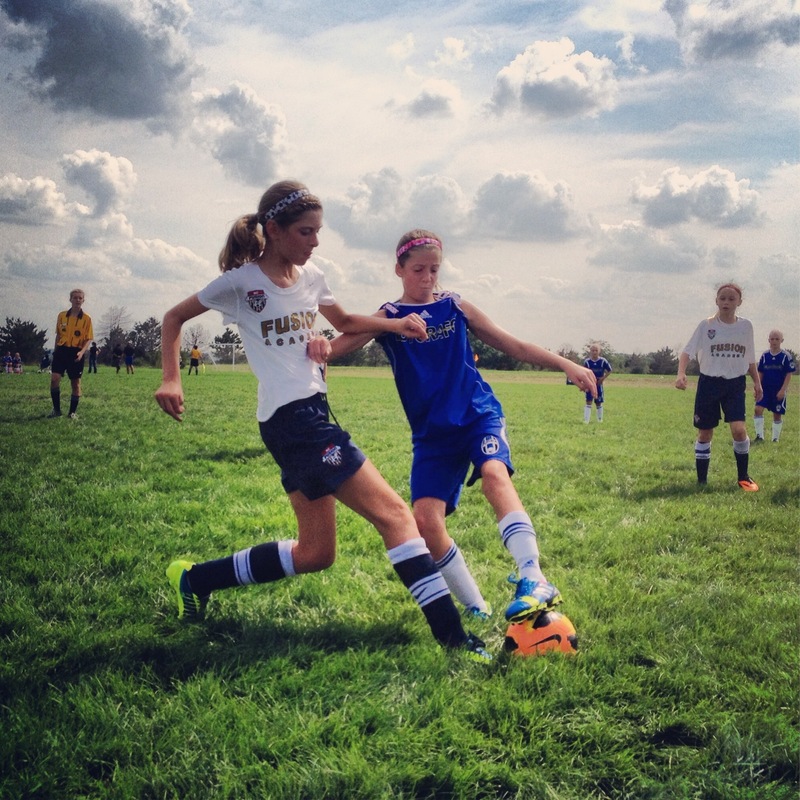 The next several days in Kansas City were spent visiting family members, attending football (soccer) games and gymnastics lessons, and the like. Four and a half days was enough time to see everyone, catch up, and then move one before wearing out my welcome. Unfortunately, no time for a side trip to Omaha or Quincy, though. Interesting conversation recently. 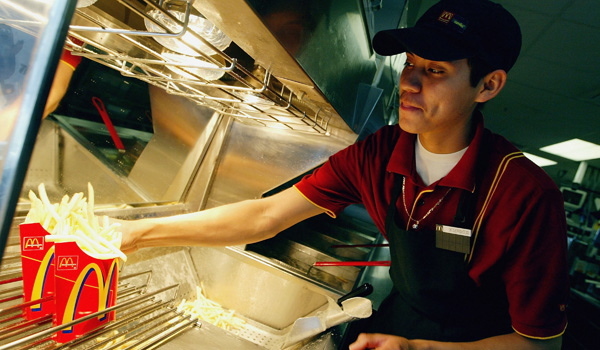 It began with the subject of the fast food workers who were striking to earn $15 an hour. It continued with a discussion of how the middle class in the United States has been hollowed out, with meaningful, well-paying jobs going overseas as consumers search for the least-expensive items without regards to the impacts of those purchasing decisions. From there, we talked about the high cost of Starbucks coffee versus the coffee at McDonald’s. I pointed out that, while there may be many reasons to explain the price difference between Starbucks and McDonald’s, one main reason has to be that Starbuck’s provides a relatively generous set of benefits to front-line employees, compared with McDonald’s. Kind of illustrates the point about the impacts of our purchasing decisions. A gross oversimplification, of course, but if we choose to buy from companies that poorly compensate their employees, we are sending a message. If we choose to buy from companies that treat employees better, we are sending another message.